And we intend to map just about everything in it, for you and everyone else. It will be a map for the future: a dynamic index of the real world, a vast index of people, places and things. Today, the 6,500 employees of HERE officially bid goodbye to Nokia and shift our global mapping and location technology plans into a higher gear with the backing of our new shareholders: AUDI AG, BMW Group and Daimler AG. It’s the beginning of a new, independent chapter in our history, which began 30 years ago when we first brought driving-specific digital maps to the car. As mapmakers, we have long dreamt of creating a precise representation of the world in digital format – one that precisely recreates the territory it seeks to represent. But, as we’ve said before and many in the field will attest, at the heart of that endeavour lay a great paradox: the closer to reality a map becomes, the less useful it tends to be. Maps have historically been abstractions of reality by necessity. They need to simplify. People need not know every inch of the territory to get from A to B. And besides, there are limits to how much information the human brain can handle. But what if map data is not only designed for direct consumption by people, but also to be read by machines capable of processing vast quantities of information? When we build maps that need to be understood only by software then the paradox falls away: one can indeed have a map that is close to 1:1 scale, thereby maximizing its usefulness to a machine such as a self-driving vehicle. With the backing of new investors, HERE today underscored a long-term commitment to be an open location platform accessible to all customers – within and outside the automotive industry – who seek to leverage the power of location in their businesses. Partners and customers will also be able to leverage HERE’s open platform to create their own services based on their unique needs and business models. In addition, HERE will be open to other investors who would create an even broader shareholder structure. HERE aims to strengthen its market position in automotive and expand our consumer and enterprise businesses through strategic partnerships and acquisitions, as well as organic growth. Currently, HERE powers its map with data from more than 80,000 sources, including highly precise static data captured by its 3D mapping cars and a wide array of dynamic data. 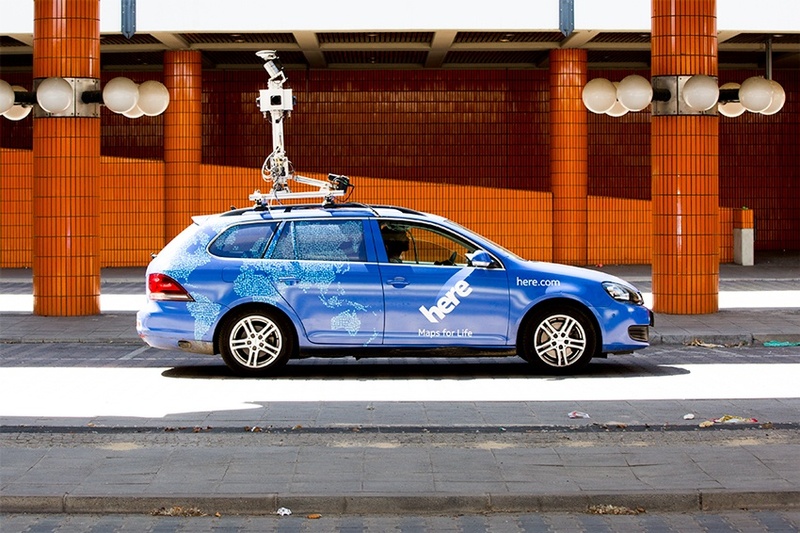 Every day, the HERE platform is enriched by billions of probe points generated by connected devices as well as a rich variety of dynamic data captured by the on-board sensors of internet-connected vehicles. Now, to further advance its plans to deliver real-time maps, HERE will be exploring the possibility of incorporating anonymized data from Audi, BMW and Daimler vehicles, with a view to entering similar discussions with more industry participants in the coming months. With its platform further enhanced by data from multiple new sources, HERE would be able to accelerate the development of the next generation map needed for automated driving for the benefit of all automotive customers, as well as to enhance the quality of its maps, products and services for customers in other industries. So, in the future, look to HERE for additional news. It’ll include smarter urban mobility, enabling further evolution of the car, a new era of transportation, and enterprises and governments having new ways to better manage assets. Thanks for your interest and support throughout our previous chapters. As the next big thing in mapping and location intelligence unfolds, you’re cordially invited to continue to watch and weigh in with your comments here on the HERE 360 blog.